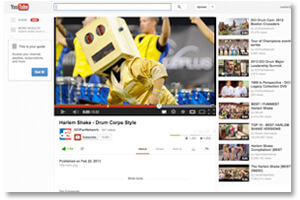 Only a few days ago, Drum Corps International published a YouTube video playing off of the popular "Harlem Shake" meme that's been sweeping the Internet. DCI's take on the video has since gone viral and racked up an impressive—and unprecedented—one million views and counting. According to Chris Weber, DCI Sr. Manager of Communications, "'Harlem Shake – Drum Corps Style' has become the most watched video we've ever produced on the DCI Fan Network YouTube page, with nearly 10 times the viewership of other videos that have been posted to the channel since it was launched in 2011." View the top 5 DCI YouTube videos of all time. "It's pretty staggering how quickly this video took hold and spread virally. We threw it together in a matter of an hour last Friday, just to have some fun with visitors to our channel over the weekend," DCI Manager of Video Services Jeff Hartowicz said. "We knew we weren't really staging the 'Harlem Shake' as it was perhaps intended, but we thought our fans might get a kick out of our content being set against this enormously popular Internet meme. It's been interesting to watch the video as a top trending clip on YouTube this week." Steadily gaining viewership after being released during the afternoon on Friday, Feb. 22, the video hit its first 100,000 views by Saturday night, and grew quickly from there. It reached a half million views on Monday and passed the 1 million mark late Wednesday morning. According to Weber, "About one percent of all who have viewed the video, took the time to post comments." "Dislikes" of DCI's take on this pop culture phenomenon outstripped "Likes" by a margin of 4 to 1. "Although we really weren't taking ourselves too seriously when we created this piece, it's obvious that some folks, including both fans and detractors, certainly did. That vocal minority may consider this the worst video to ever hit DCI's YouTube channel." According to DCI Marketing Director Bob Jacobs, all of the comments provide invaluable insights into the reach of the content, helping his team to tailor future releases. "We're always seeking opportunities to increase the awareness and relevance of Drum Corps International and its affiliated brands," Jacobs said. "With a small staff and limited marketing resources, we continue to learn a great deal about our highly engaged worldwide audience base through ongoing research and experimentation such as this. It's obvious that this video spread well beyond our normal audience which is always a great learning experience for our team." and YouTube, DCI reaches a broad, and growing, international audience. Jacobs says that DCI has spent the last six months specifically studying social media opportunities and looking to aggressively grow DCI's online following through multiple channels. 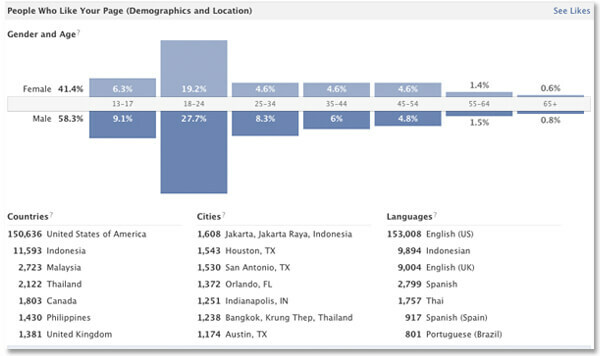 Through its rapidly growing Facebook and Twitter following, the organization has been focusing on "sweet spots" of release times and content types which garner the greatest response. "Although we never intended nor foresaw a response to this video becoming our most-viewed effort, the experience will ultimately help us to focus future campaigns on reaching the greatest possible number of people, increasing awareness and worldwide demand for content from each of the brands which comprise the DCI master brand," Jacobs said. On the positive side of the popular video, the viewership has resulted in hundreds of new subscribers to DCI's YouTube channel and hundreds of new Facebook followers along with thousands of paid advertising impressions. Also important has been the resulting overall YouTube channel views accumulated, which is a strong selling point to current and potential corporate partners. "Our sponsors are looking for value and measurable impressions," DCI Director of Business Development John DeNovi said. "The more we learn about triggers for viral content, the more value we can add to the sponsor relationships through these channels. Our intent is to create win/win relationships at every opportunity. This experience has provided us with invaluable insights which will become a part of our ongoing development efforts." Like many YouTube sensations of recent years from "Chocolate Rain" to "Gangnam Style," the "Harlem Shake" internet phenomenon will more than likely fade into relative obscurity soon. But in the meantime, several drum corps have been able to have a little fun along the way while serving to grow their own visibility. Among the corps to get in on the "Shake" have been the Mandarins, Blue Saints, and all-age ensemble Atlanta CV. Another notable release featuring marching arts content and garnering tremendous exposure through YouTube was Shaun Canon's "Live for Music" video, produced in 2012. Two versions of the video were released, both featuring DCI performance footage, for a combined total viewership in excess of 1.2 million.